May 27, 2010 – Lake Pontchartrain- a massive body of water situated on the rim of New Orleans’ westbound perimeter. The lake is more than just an untapped source of relief for the Gulf Coast seafood industry in the aftermath of the BP oil spill; it also serves as a boundary between multiple parishes, where lifestyles can vary drastically. One aspect of Northshore life that has transpired flawlessly across the lake, however, is quality of football. Northshore football is every bit as competitive and intense as the state of Louisiana demands, and consistently generates major D1 recruits. 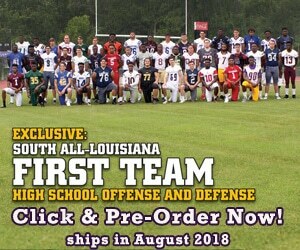 The talent is evenly concentrated and distributed throughout individual areas, yielding the incredibly tight divisional standoffs that characterize the Cajun gridiron scene. That being said, the Northshore teams with the most to prove this year are Franklinton and Salmen, both 4A and both recurrent dominators. Both of these schools will retain experienced players and coaching staffs that have danced the playoff dance many times with consistent success. These teams are also notable for exceptional defensive proficiency, particularly Franklinton, who predicated much of its recent success on their defense’s ability to create turnovers and short fields. And while these two teams epitomize the strength, athleticism, and experience on the other side of the lake, they are ironically district rivals and therefore just the tip of the Northshore football iceberg. Mandeville will be a force to contend with on the 5A circuit where experience generally correlates to success, and with rivals Fontainebleau, Slidell, and Ponchatoula all in rebuilding phases, Mandeville’s upperclassmen-laden team is in great divisional position. Many of these “rebuilding” programs have been rapidly promoting and developing incoming freshmen into starters, a process which should come to fruition within the next couple seasons. On the smaller circuits, there is equal athleticism and potential, but predictably inadequate numbers. Pope John Paul, a 2A school in Slidell renowned for their triple option style of offense, is remarkably well recovered from the impending loss of 23 seniors. Along with Northlake Christian and their two tight end based offense (easily transitioned into the spread), Pope John Paul is in good shape district-wise, and has improved offensive and defensive lines. And on the smallest (1A) spectrum, traditional powerhouse Kentwood is on pace to re-attaining that status after a couple “off” years. Kentwood holds the record for most consecutive playoff appearances, which they hope to continue this year behind a young but incendiary defense. A recent influx of female students has inhibited football turnout for Kentwood, but with excellent middle school feeder programs and lots of partially-developed young talent, they will undoubtedly be contenders this season. The bottom line is simply that Northshore football has several potential state champions to watch out for this season. As a whole, the parishes of St. Tammany, Washington, and Tangipahoa will be disabusing any notions of Lake Ponchartrain preventing top-tier Louisiana football from existing across the water.